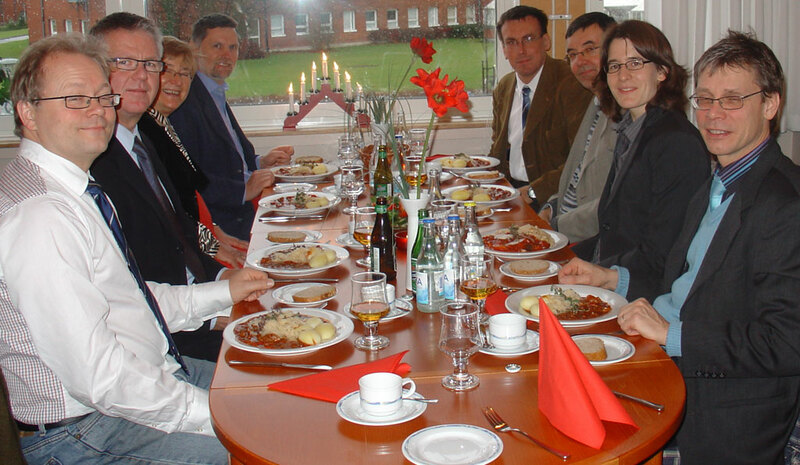 Andy Burrows, Andy Horsewell, Anita Kildebaek Nielsen, Lionel Cervera Gontard, Nicole MacDonald, Jakob Wagner, Anne Marie Rasmussen, Rafal Dunin-Borkowski. 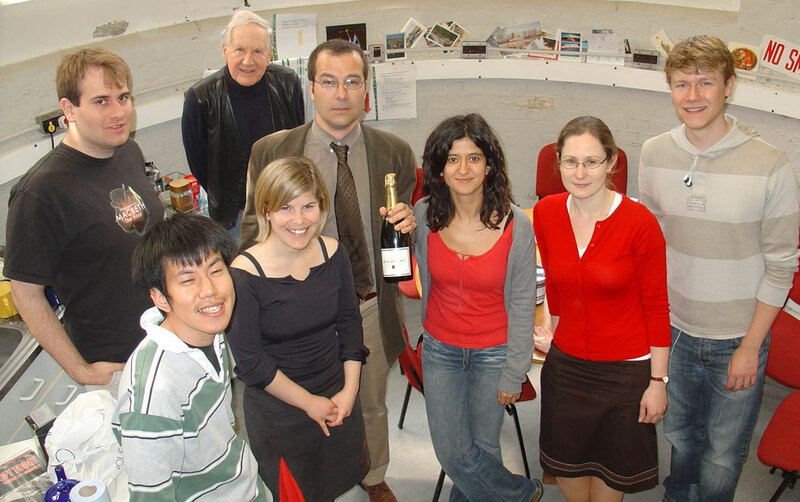 Takeshi Kasama, Richard Beanland, Ana Hungria, Cate Ducati, Yanna Antypas, Rafal Dunin-Borkowski, Jon Barnard, Marco Beleggia, Owen Saxton, Tom White, Juan Carlos Hernandez, Jo Sharp. 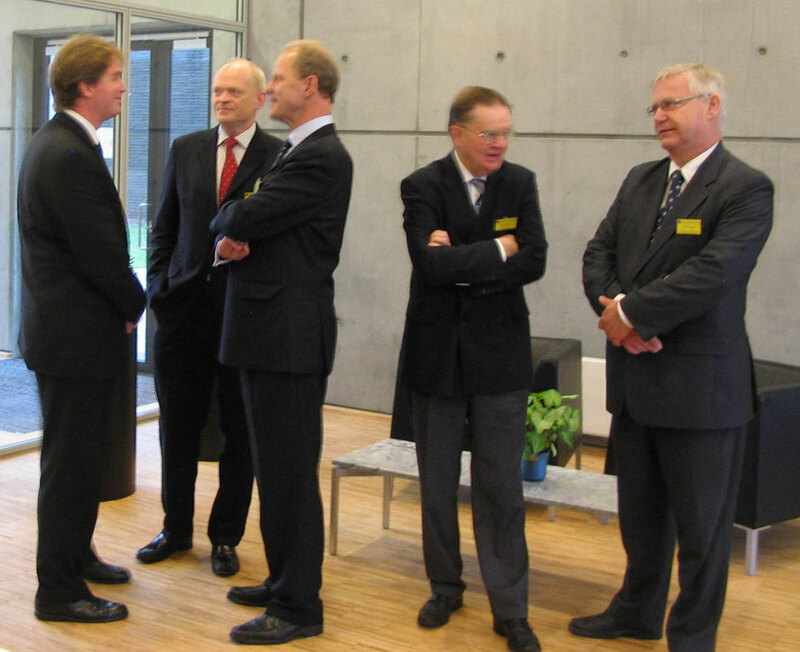 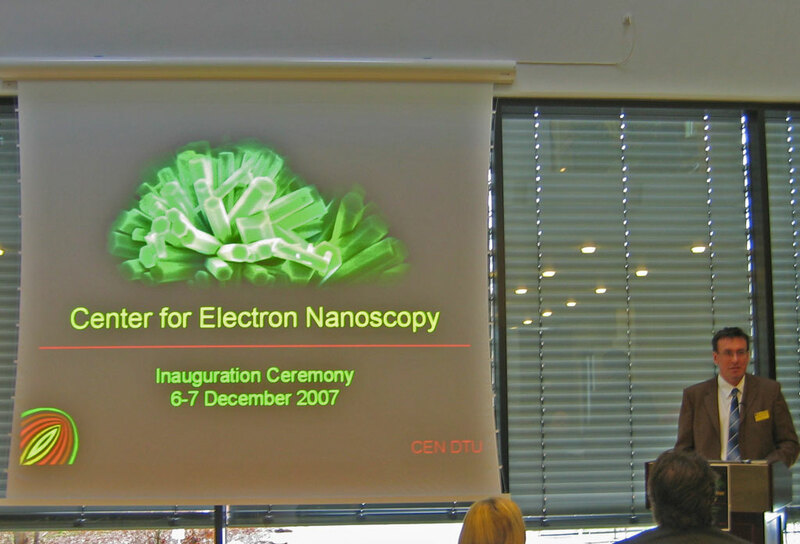 The inauguration celebrated the completion of the Center for Electron Nanoscopy at DTU, and the installation of seven new electron microscopes, in less than a year.This photograph of most of the participants at the inauguration ceremony was taken on 6 Dec 2007. 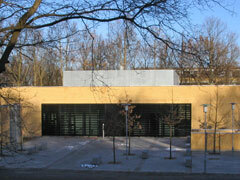 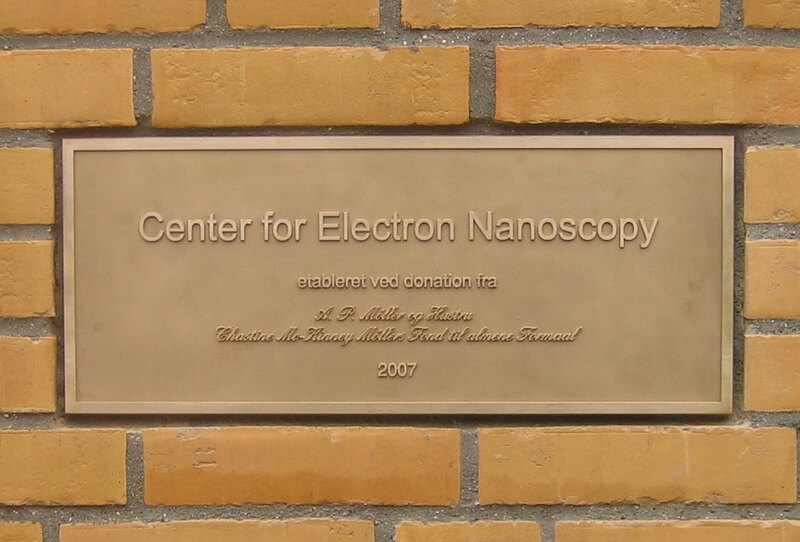 The completed Center for Electron Nanoscopy at DTU. 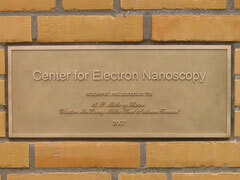 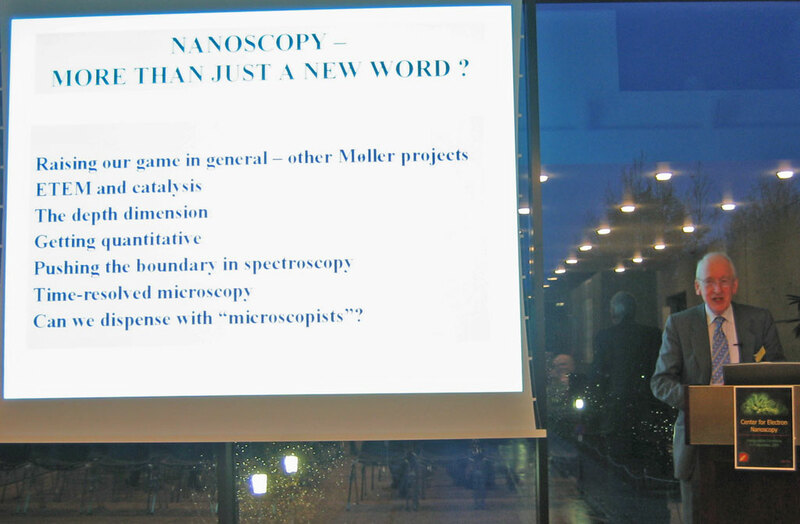 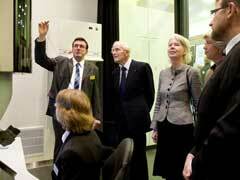 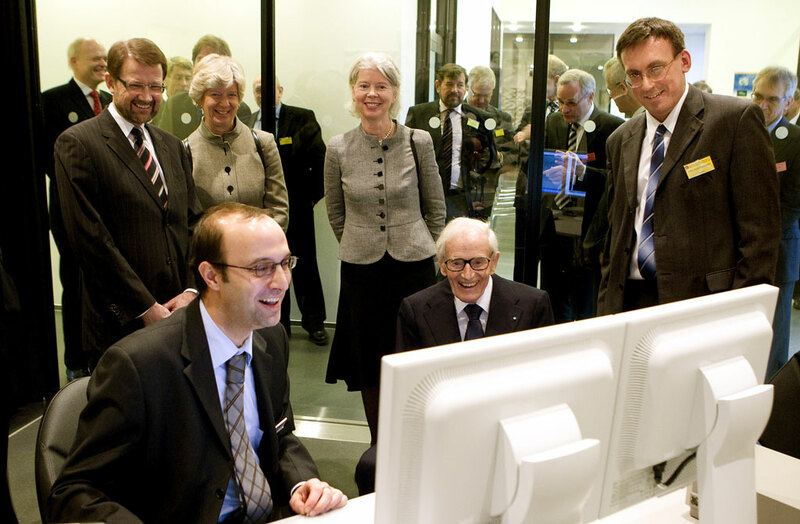 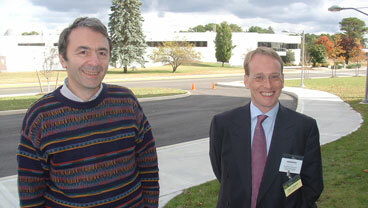 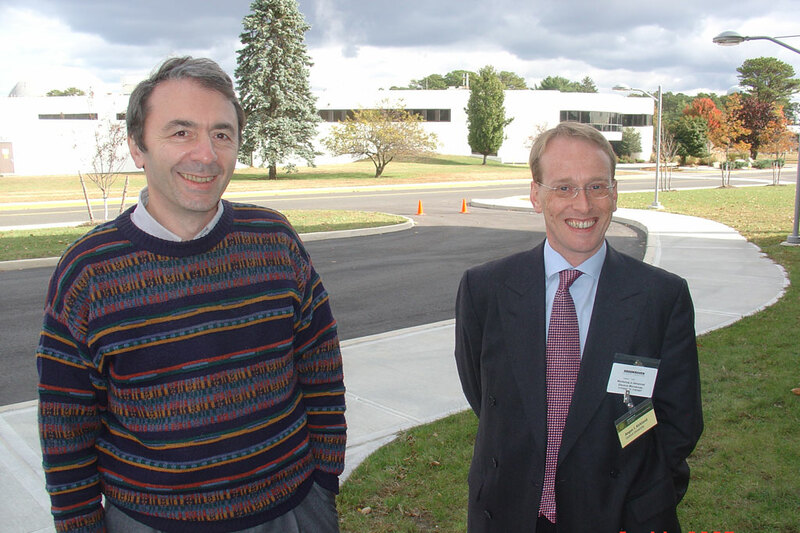 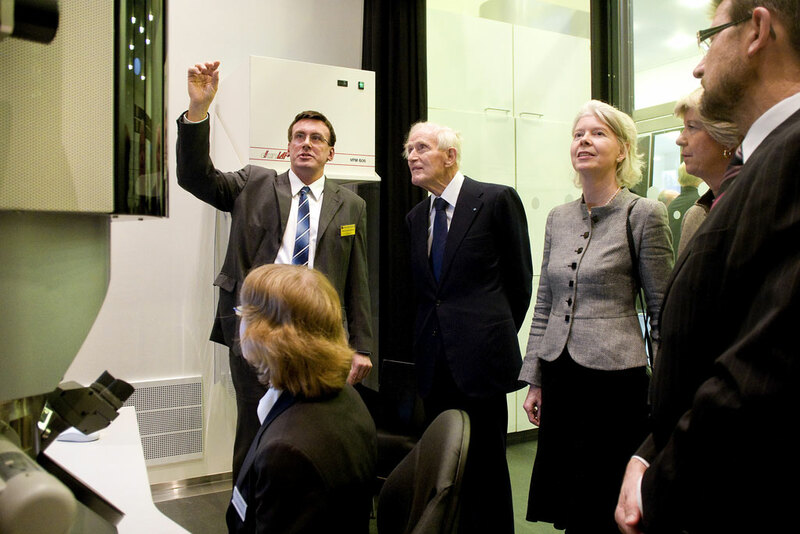 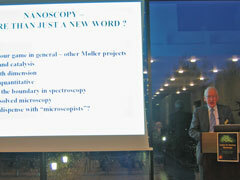 The plaque on the Center for Electron Nanoscopy, unveiled on 7 Dec 2007 by Maersk Mc-Kinney Moeller. 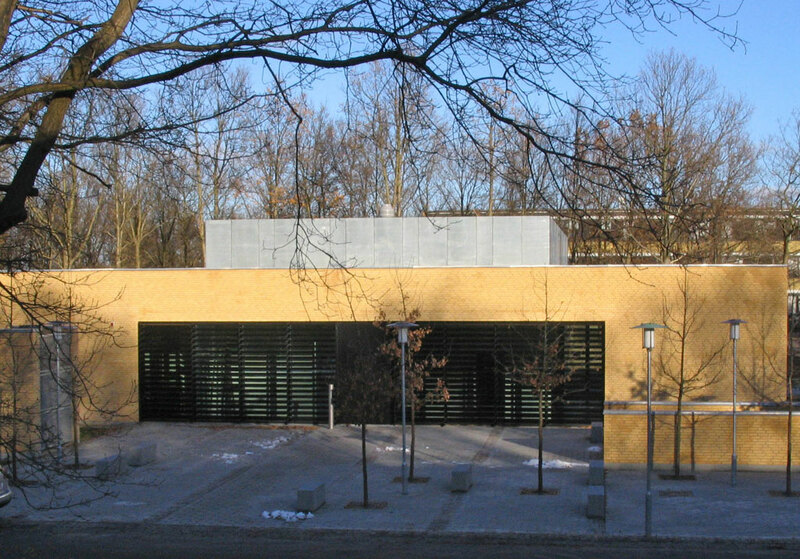 The seminar room in Bulding 311. 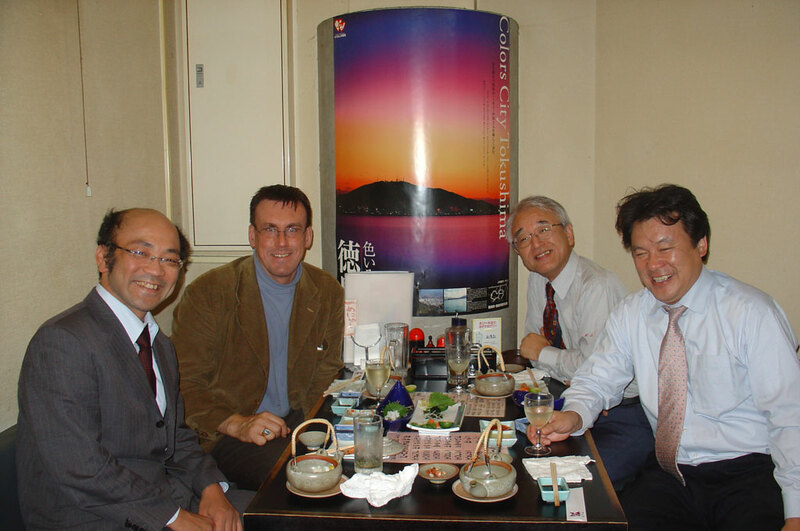 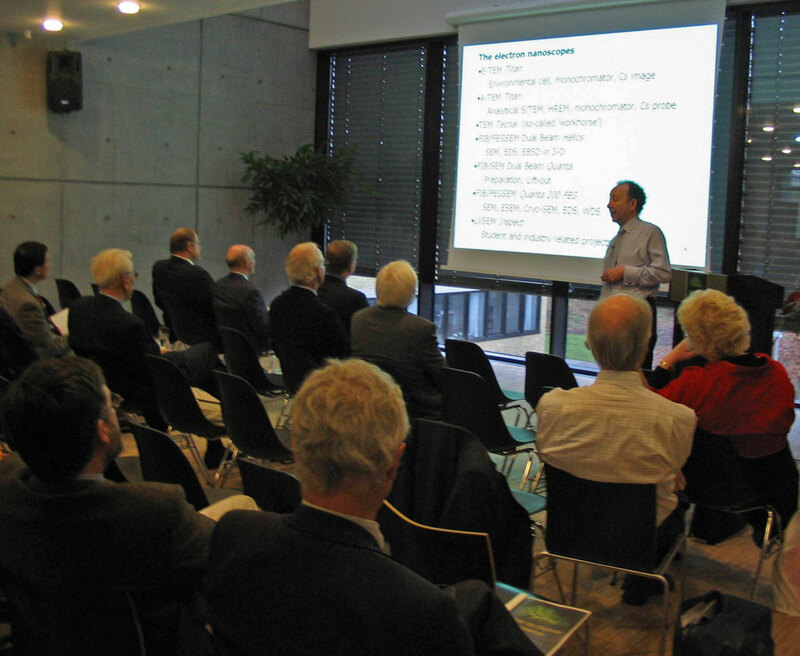 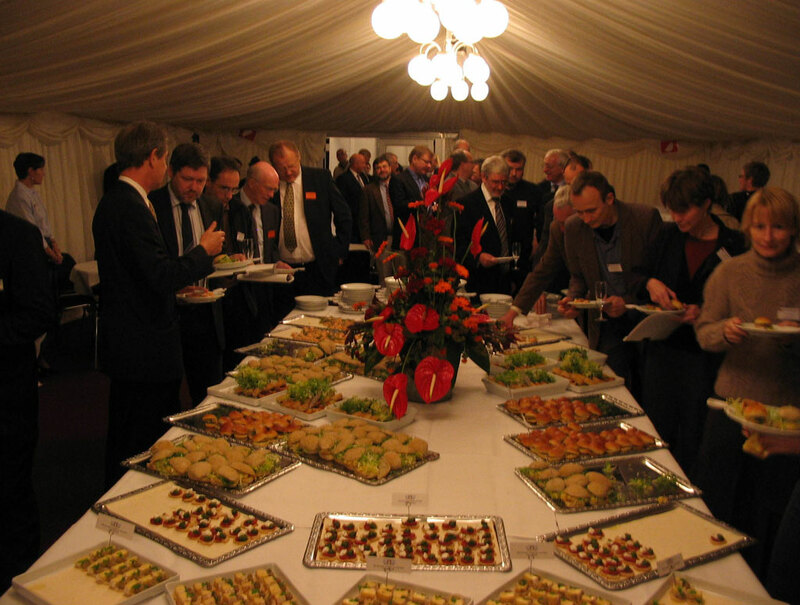 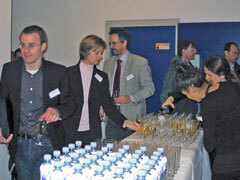 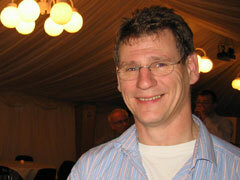 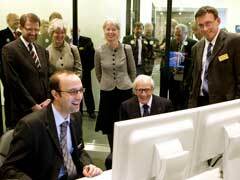 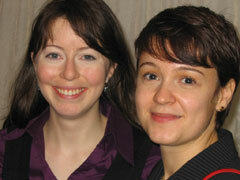 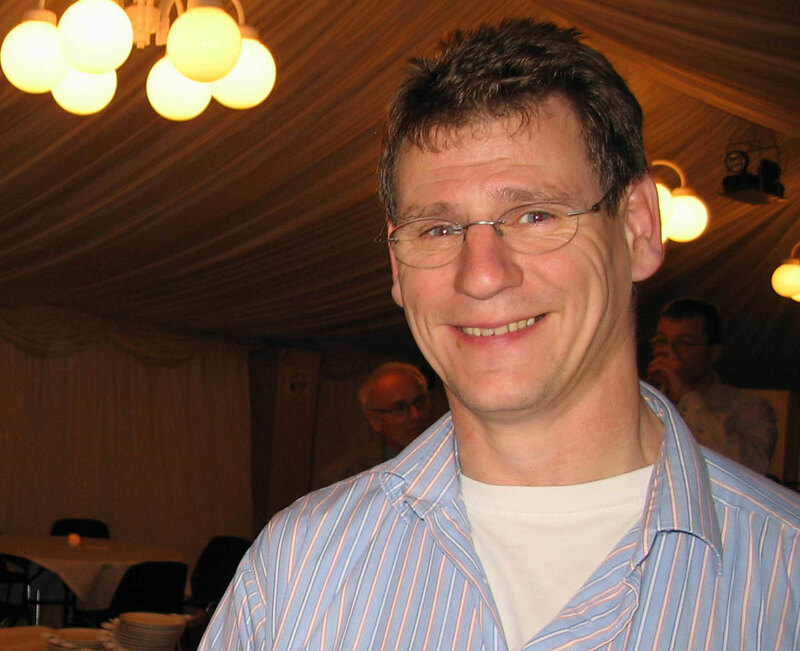 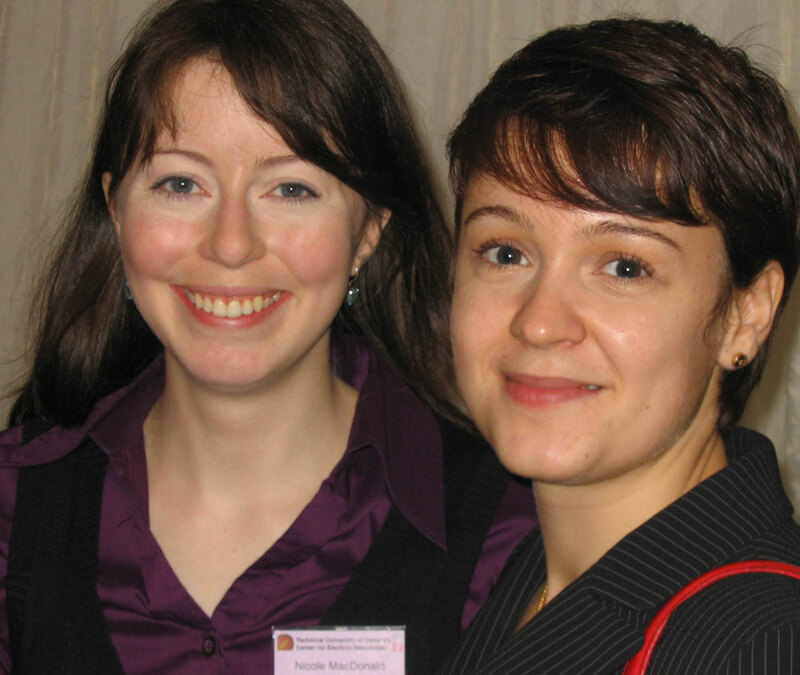 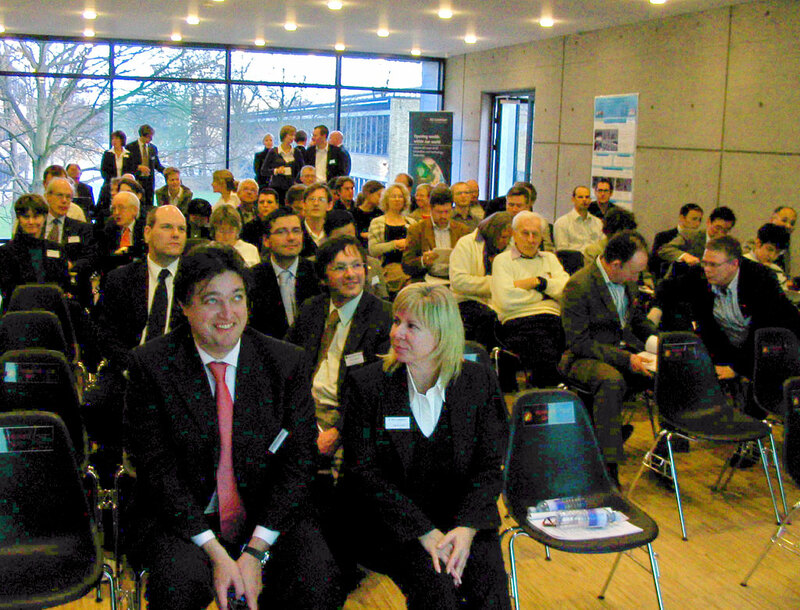 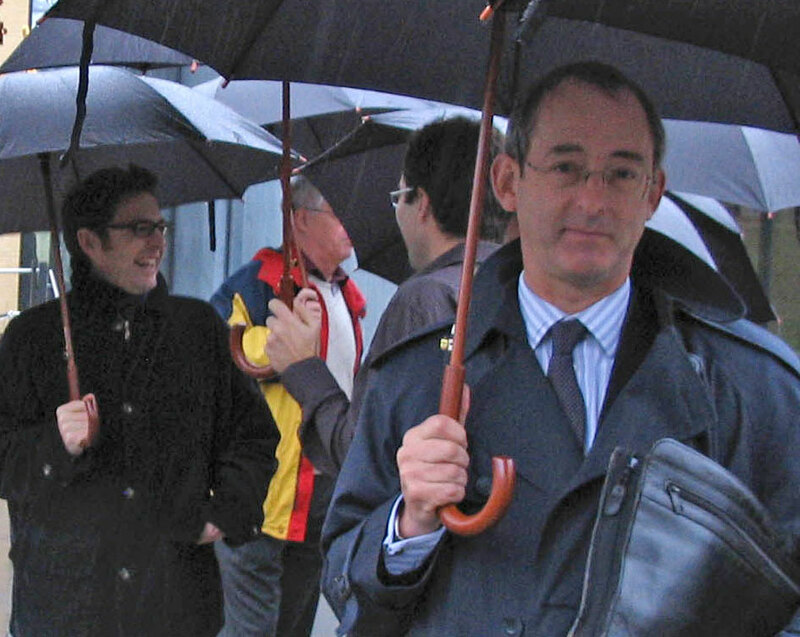 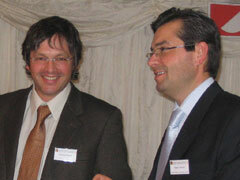 This picture was taken at the start of the scientific seminars held on 6 Dec 2007. 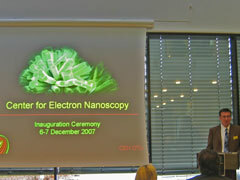 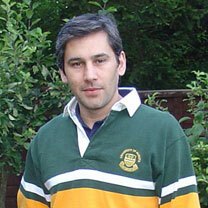 Welcome and introduction on 6 Dec 2007. 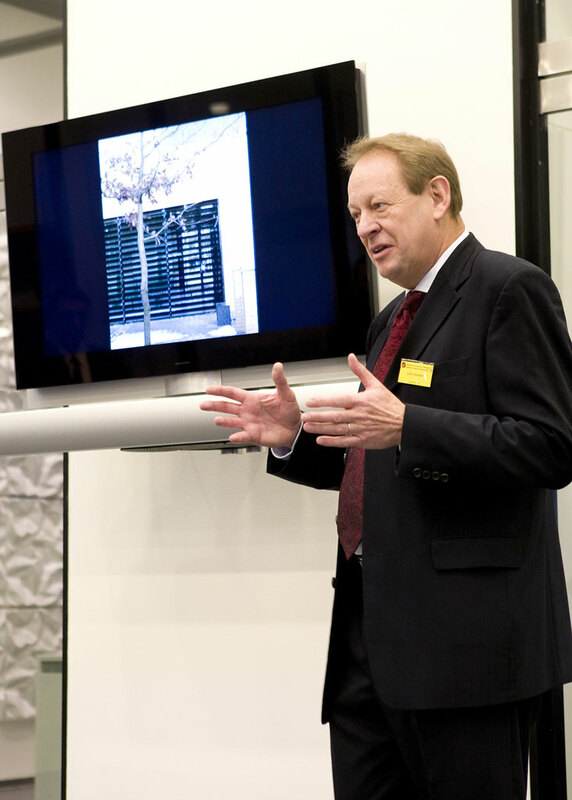 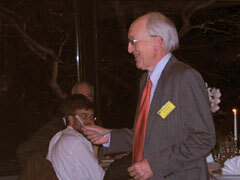 Archie Howie reading a poem at the dinner held at Langelinie Pavillonen on 6 Dec 2007. 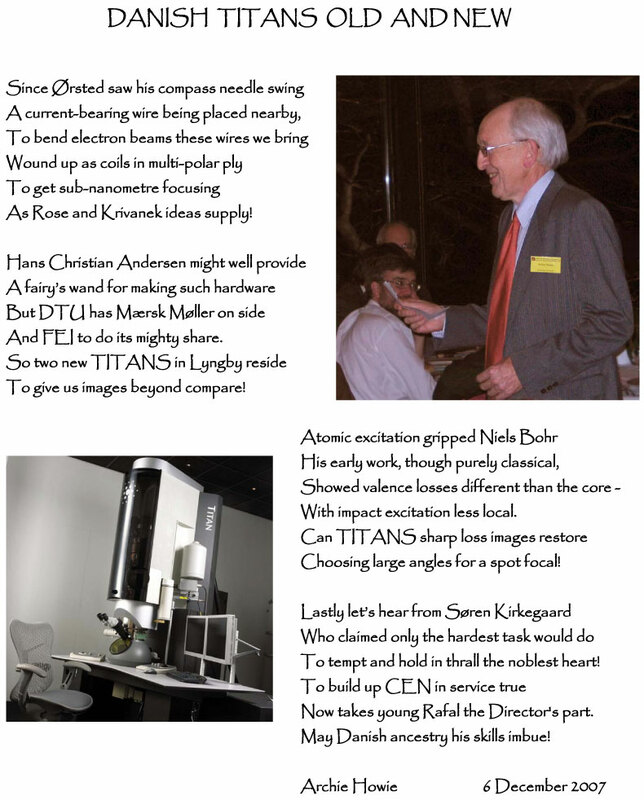 Click on the picture for the text of the poem. 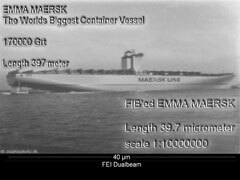 Waiting for Maersk Mc-Kinney Moeller to arrive. 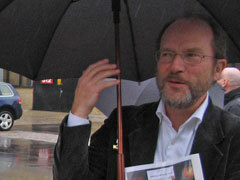 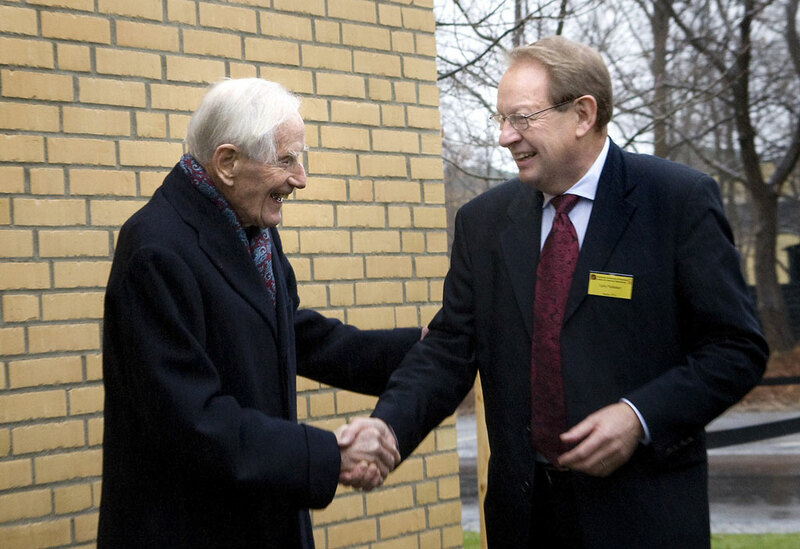 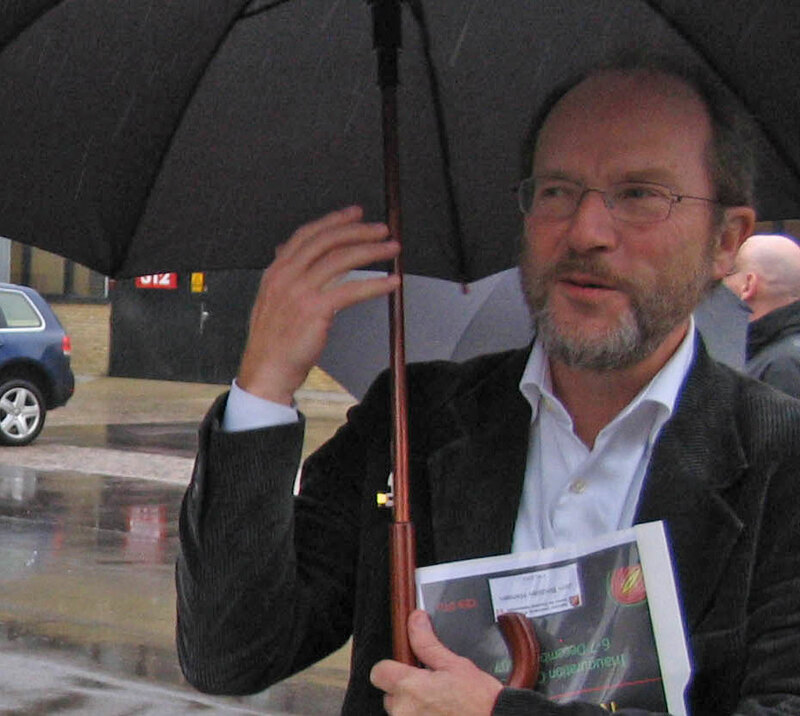 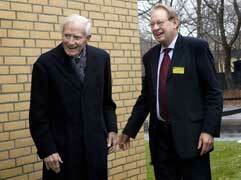 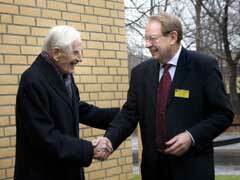 Maersk Mc-Kinney Moeller and DTU's Rector Lars Pallesen outside the CEN building. 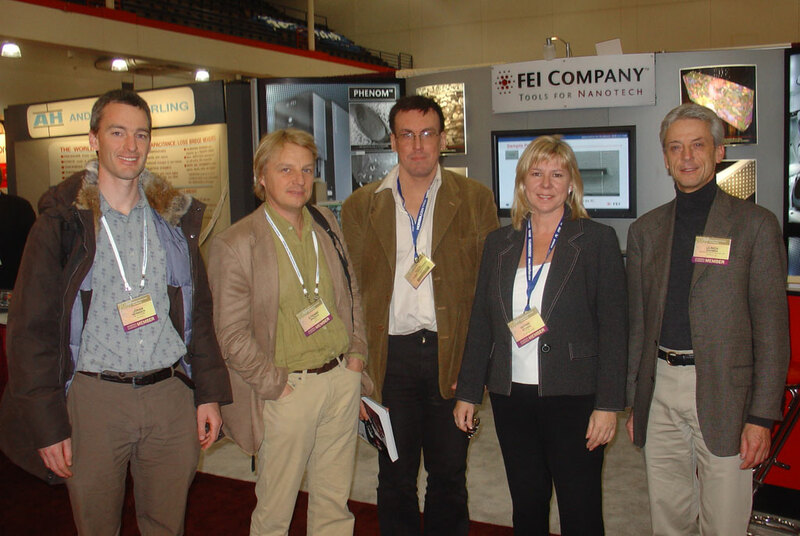 Tour of the FEI Titan Environmental TEM. 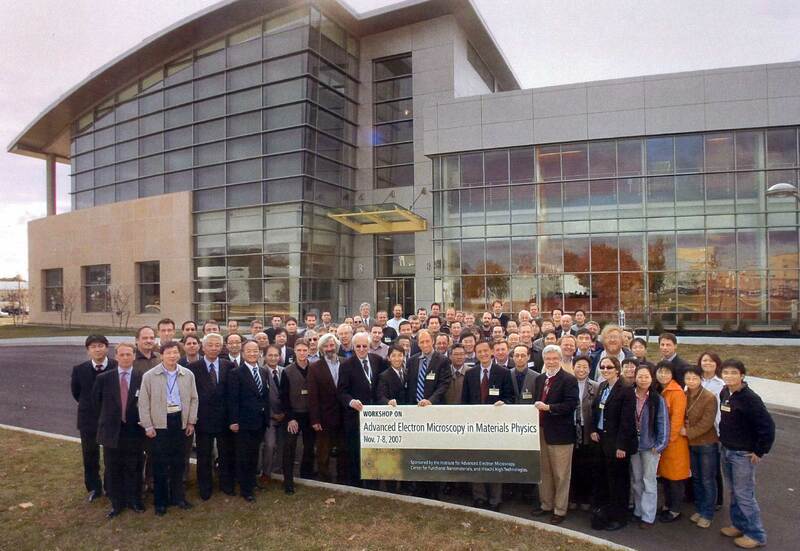 Tour of the FEI Helios Dual-Beam FIB-SEM. Maersk Mc-Kinney Moeller signing CEN's visitors' book. 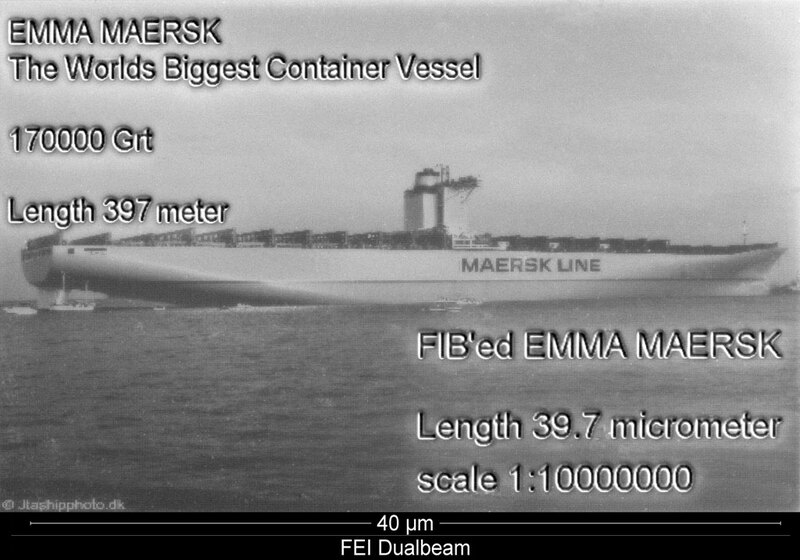 Image of the Emma Maersk container ship fabricated on the Dual-Beam FIB-SEM at a scale of 1 to 10 million. 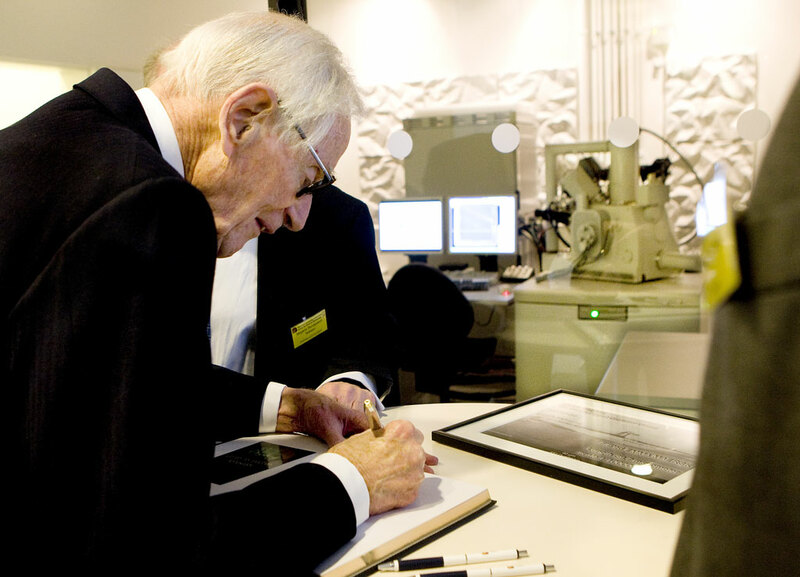 A framed copy was given to Maersk Mc-Kinney Moeller during his visit. 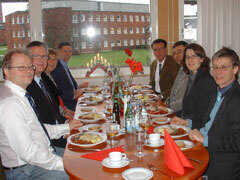 Leaving the CEN building to have lunch in the Rector's office. 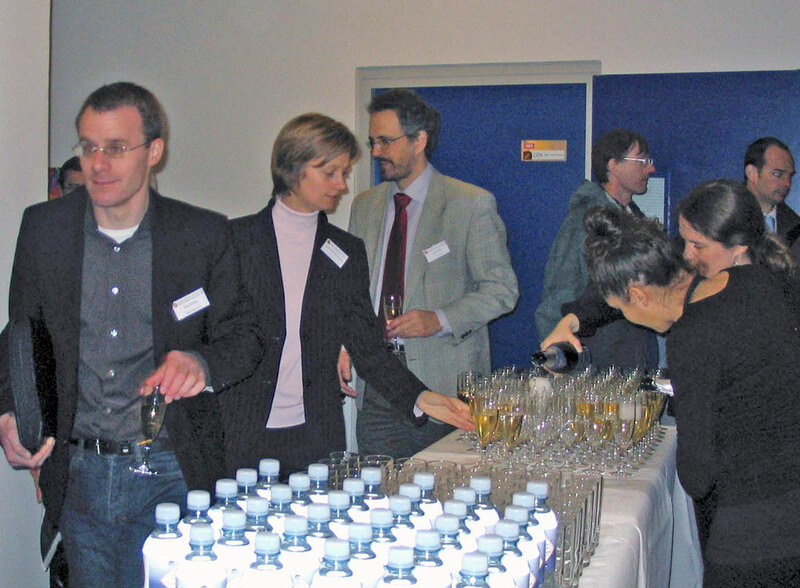 Champagne after the offical inauguration. 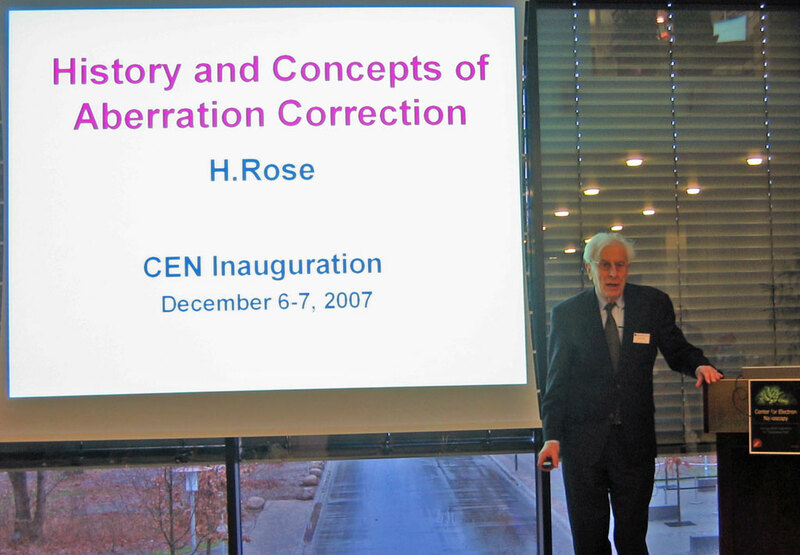 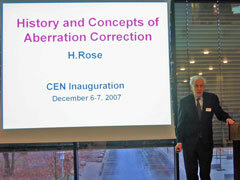 Harald Rose's talk about aberration correction. 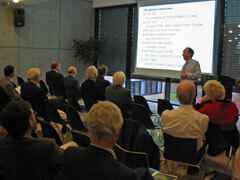 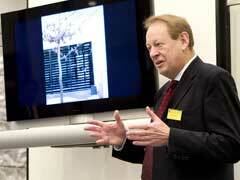 Andy Horsewell's talk about the CEN building. 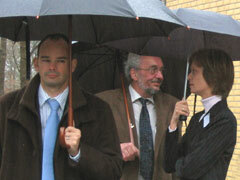 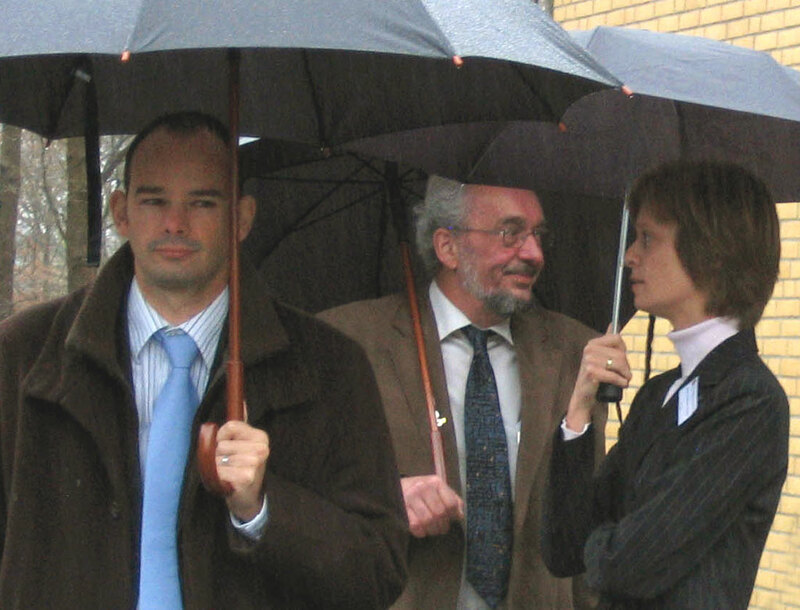 Jacob Bowen, Ole Hansen, Jane Hvolbaek Nielsen. 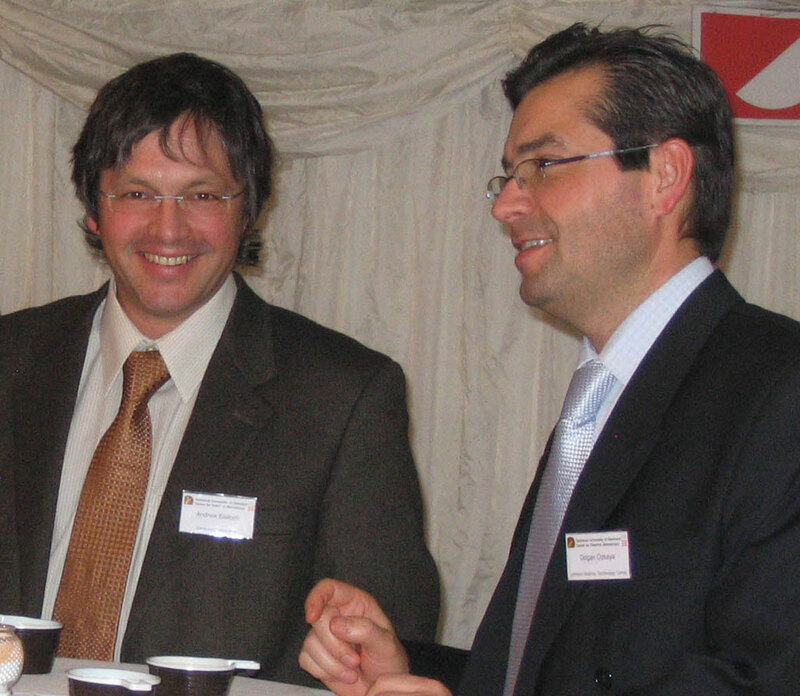 Zuzanna Liliental-Weber, Jakob Wagner, Erik Johnson. 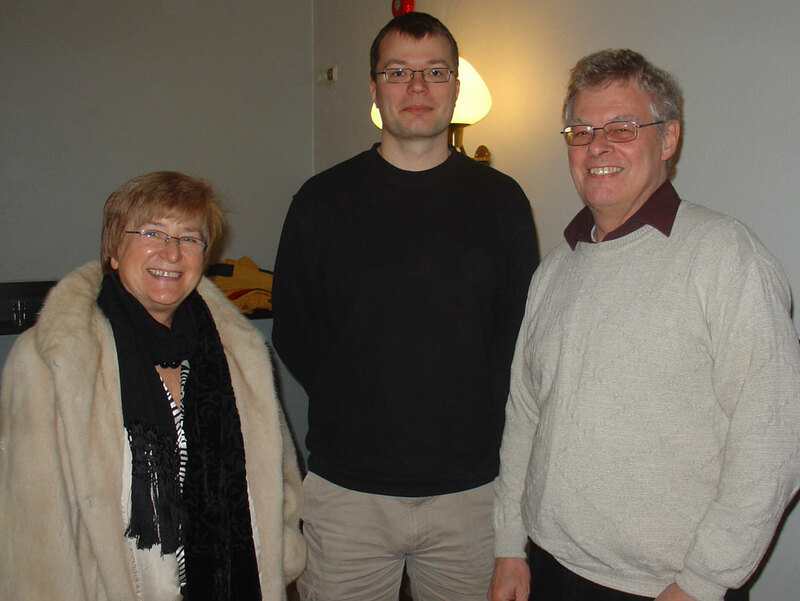 Erik Johnson, Jakob Wagner, Lisa Karlsson. 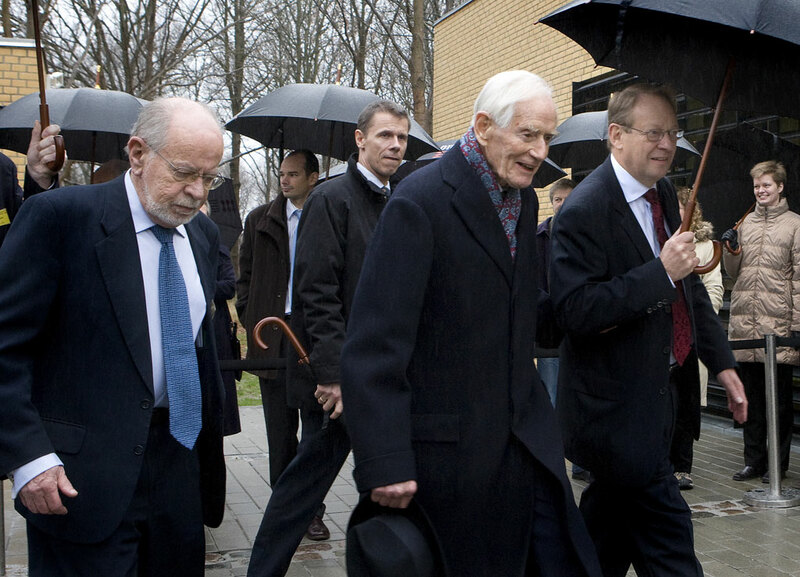 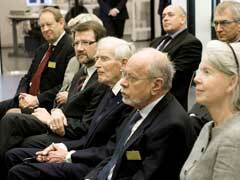 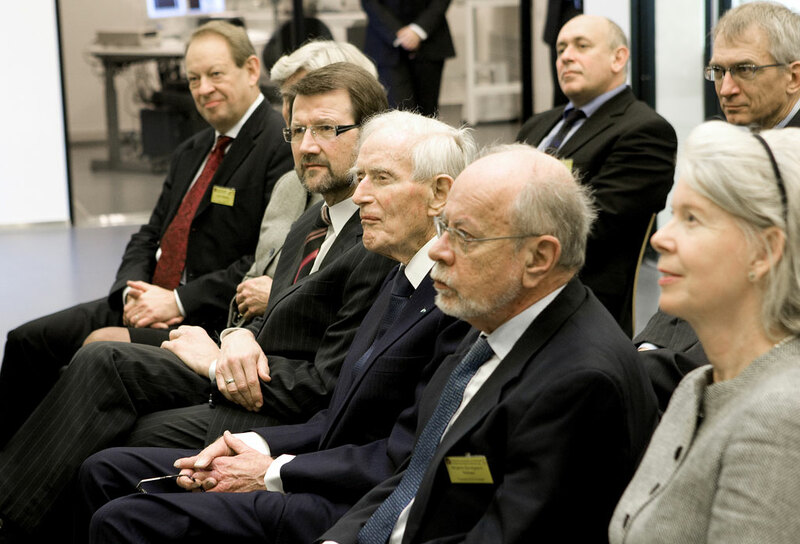 Sven Lidin, Jan-Olle Malm, Zuzanna Liliental-Weber, Knut Deppert, Rafal Dunin-Borkowski, Stig Stenstrom, Lisa Karlsson, Reine Wallenberg. 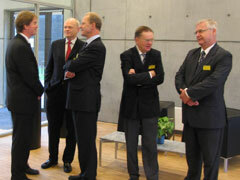 Etienne Snoeck, Martin Hytch, Jo Verbeeck, Peter van Aken, Michael Lehmann, Wouter Van den Broek, Sandra van Aert. 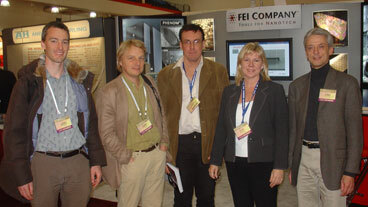 Jo Verbeeck, Etienne Snoeck, Rafal Dunin-Borkowski, Debbie Stokes, Uli Dahmen. 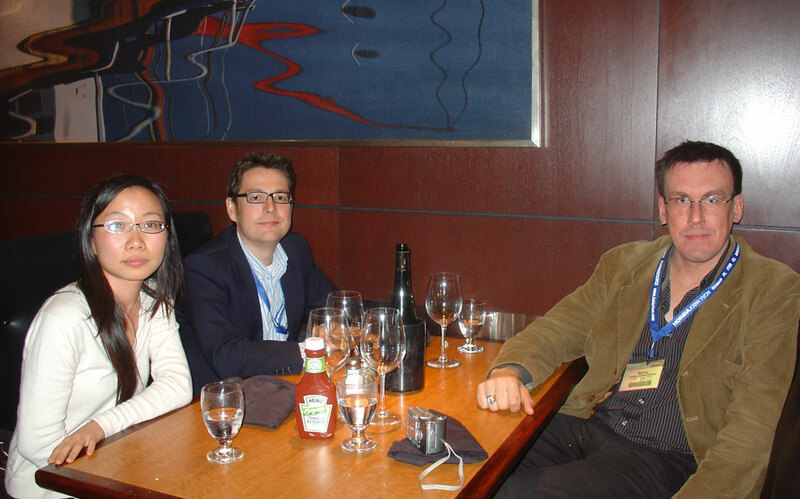 Shery Chang, Martin Hytch, Rafal Dunin-Borkowski. 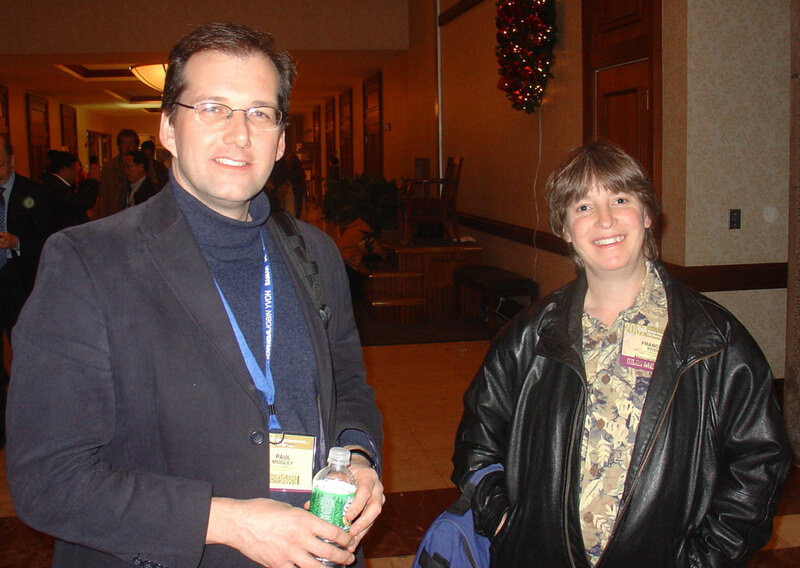 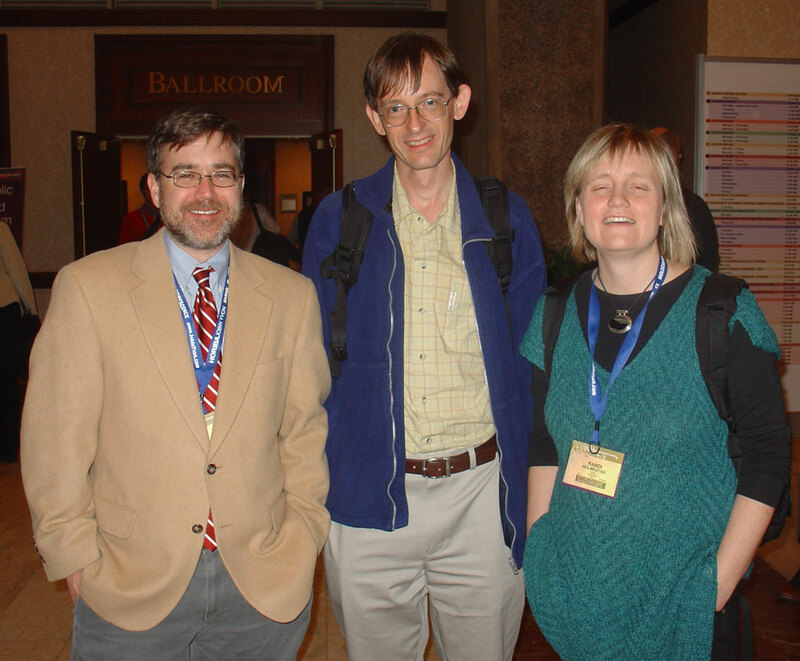 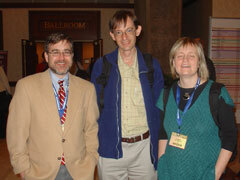 Eric Stach, Chris Boothroyd, Randi Holmestad. 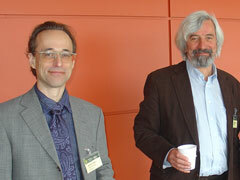 Michael Gribelyuk and Angus Kirkland. 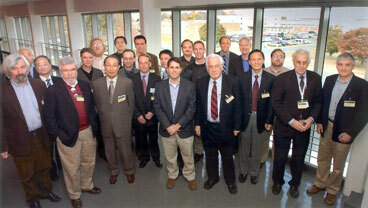 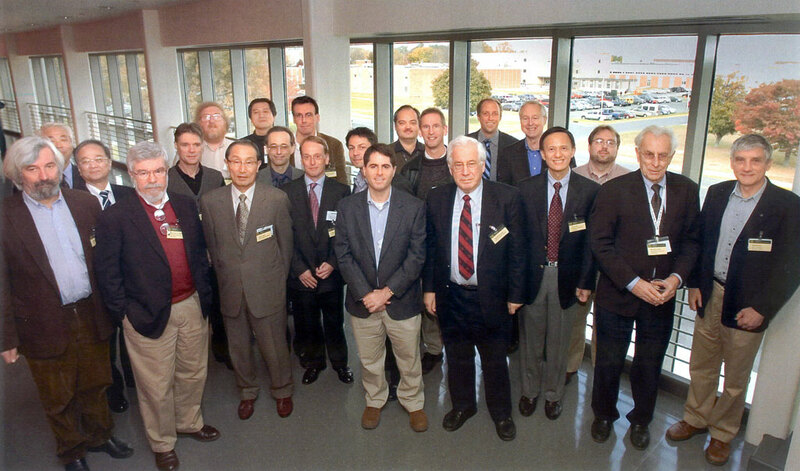 Picture of workshop organizers and invited speakers taken by conference organizers. 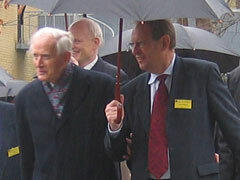 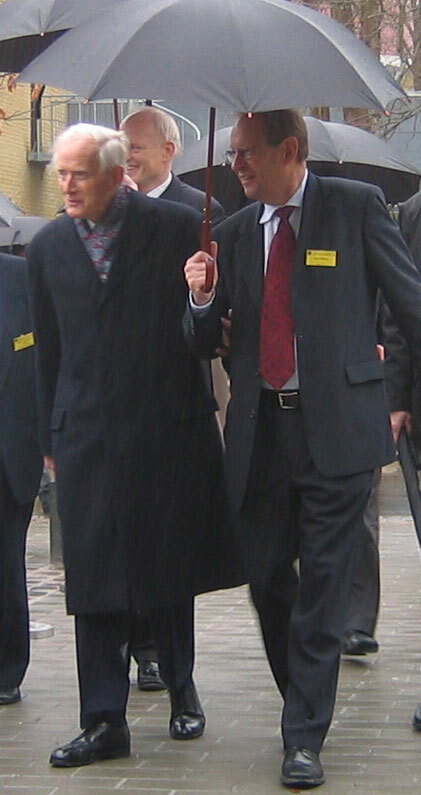 Bernd Kabius and Max Haider. 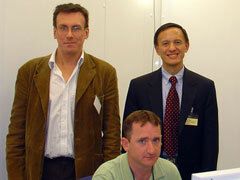 Kenji Kaneko, Rafal Dunin-Borkowski, Kazuo Ishizuka, Shuichi Takahashi. 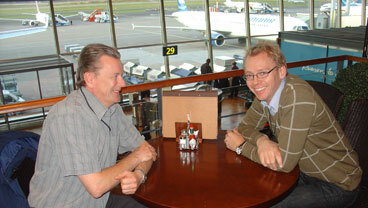 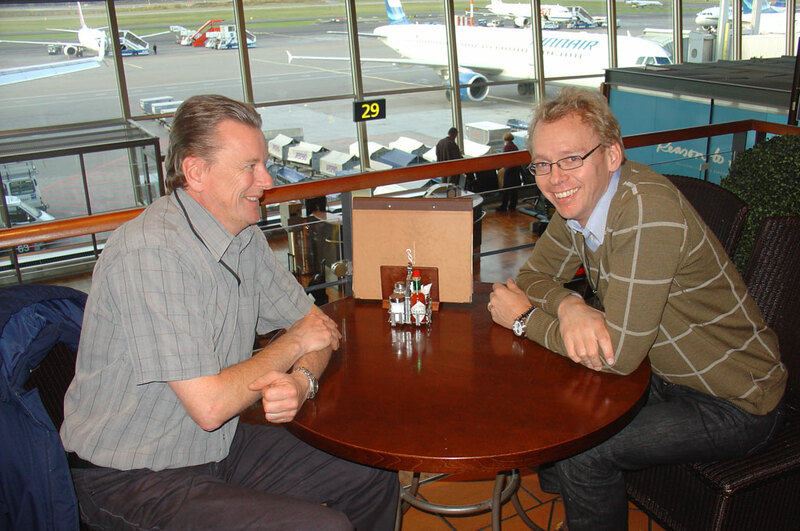 Alan Robins and Mats Eriksson (at Helsinki airport on the way to Tokushima). 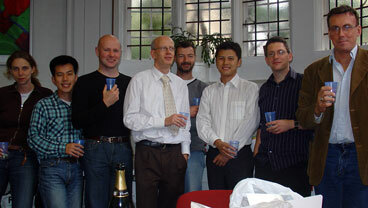 Alex Porter, Takeshi Kasama, Jon Barnard, Thomas Walther, Richard Beanland, Ran Chong, Richard Harrison, Rafal Dunin-Borkowski. 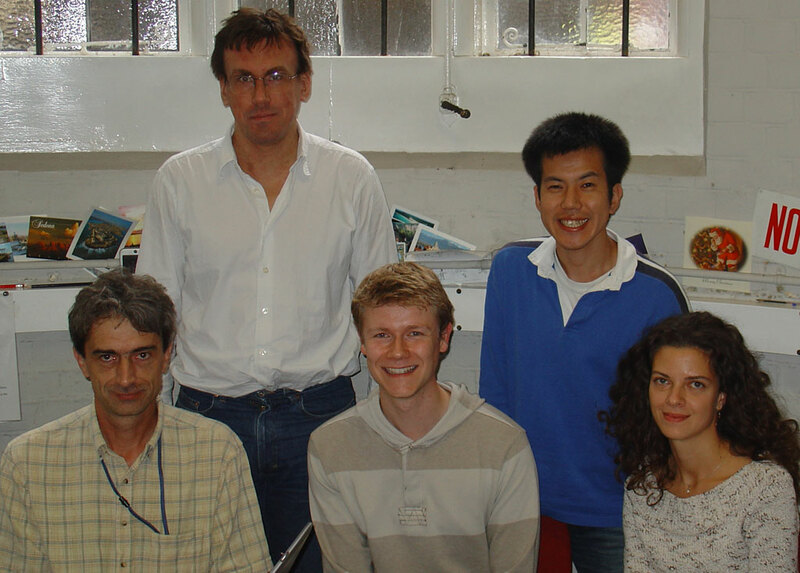 Alison Twitchett-Harrison, Jon Barnard, Thomas Walther, Owen Saxton, Cate Ducati, Ryan Chong, Takeshi Kasama, Rafal Dunin-Borkowski. 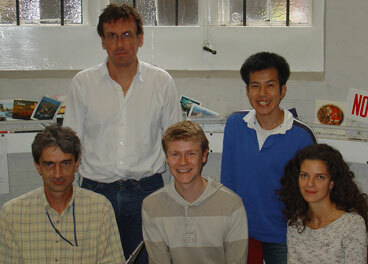 Standing: Takeshi Kasama, Erika Palin, Ed Simpson, Nathan Church. 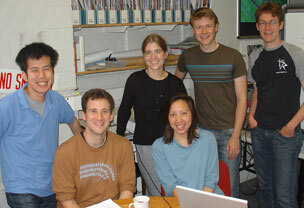 Seated: Josh Feinberg, Amy Chen. 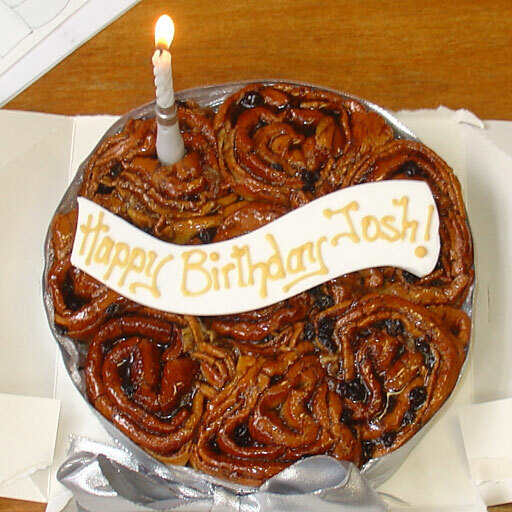 Josh's chelsea bun birthday cake. 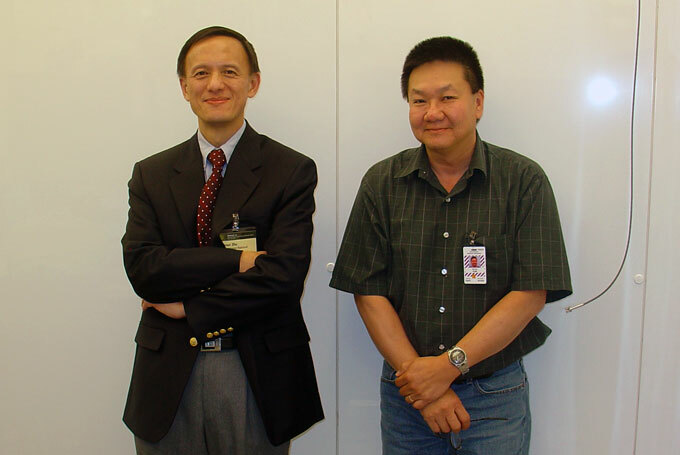 Standing: Rafal Dunin-Borkowski, Takeshi Kasama. 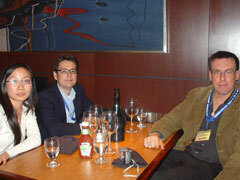 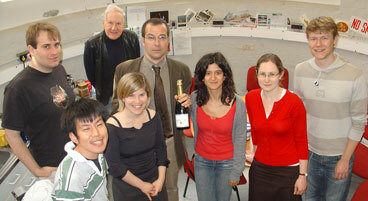 Seated: Mihaly Posfai (visiting Cambridge from Veszprem), Ed Simpson, Ilona Kosa (visiting Cambridge from Veszprem). 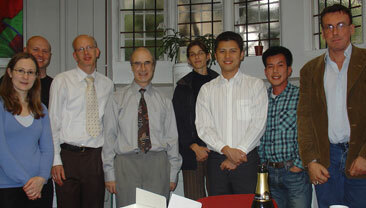 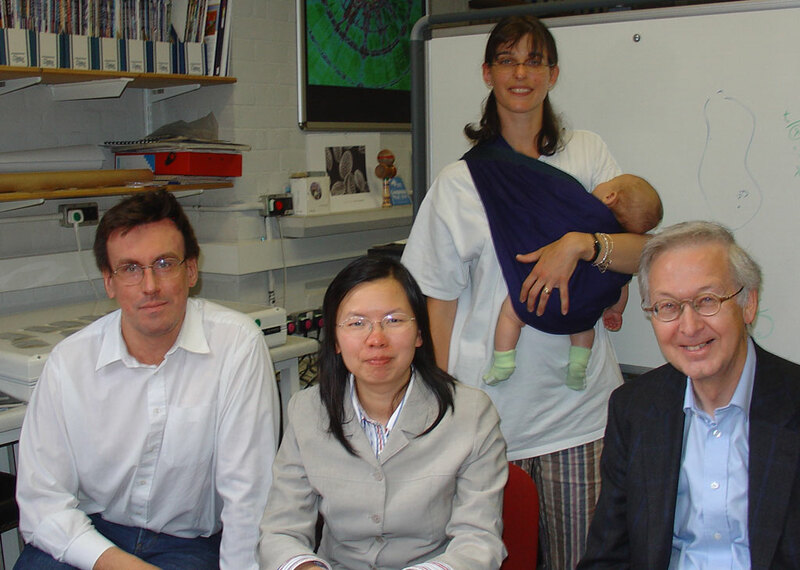 Rafal Dunin-Borkowski, Qing Chen (visiting Cambridge from Beijing), Cate Ducati, Colin Humphreys. 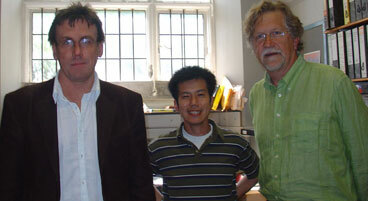 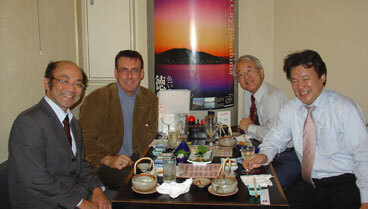 Rafal Dunin-Borkowski, Takeshi Kasama, Andrew Putnis (visiting Cambridge from Muenster). 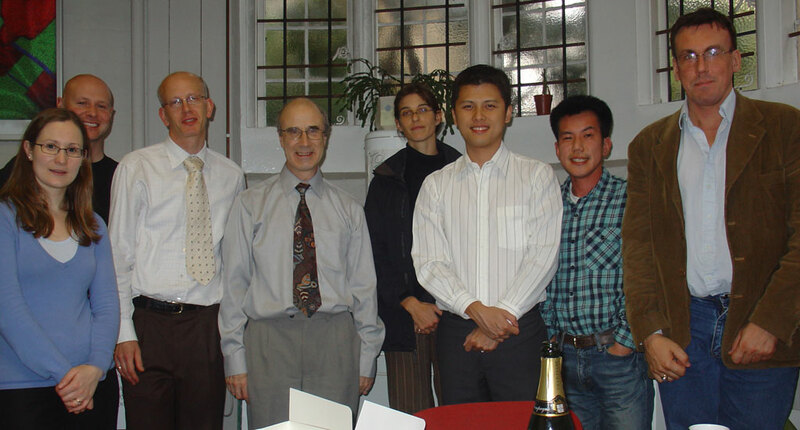 Back row: David Smith, Dietrich Schulze, Karin Vogel, Marco Beleggia, Grigore Moldovan, Dorin Geiger, Sarah Haigh, NN, Harald Rose, NN, Cheuk-wai Tai,NN, Paul Simon, NN, Axel Rother, Margarita Weiss, Christopher Matzeck, Johan Verbeeck, Alison Harrison, NN, Kurt Scheerschmidt, David Cooper, Michael Lehmann, Andreas Lenk. 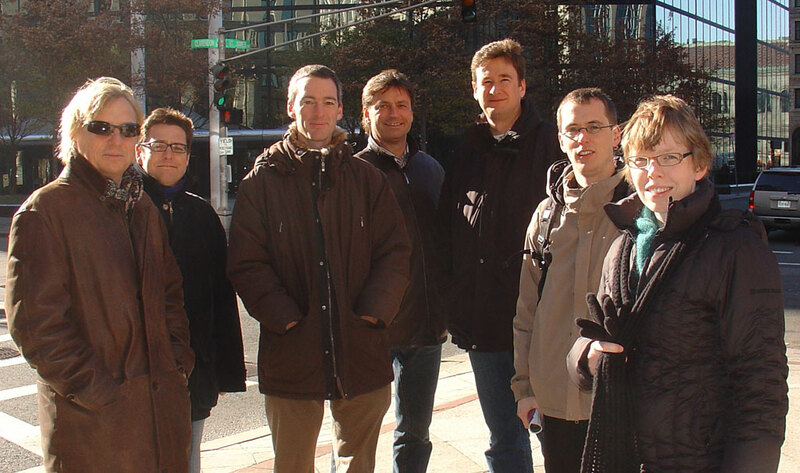 Front row: Rafal Dunin-Borkowski, Giorgio Matteucci, Hanne Lichte, Giulio Pozzi, Wilder Carrillo-Cabrera, Yossi Lereah, Filippo Ubaldi. 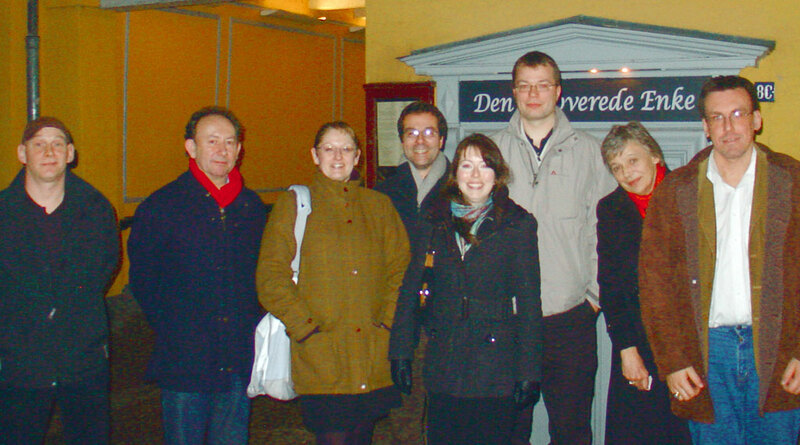 Tom White, Takeshi Kasama, Ron Broom, Cecilia Galindo Gonzalez, Lionel Cervera Gontard, Ana Hungria, Alison Twitchett-Harrison, Ed Simpson. 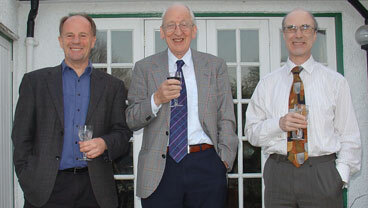 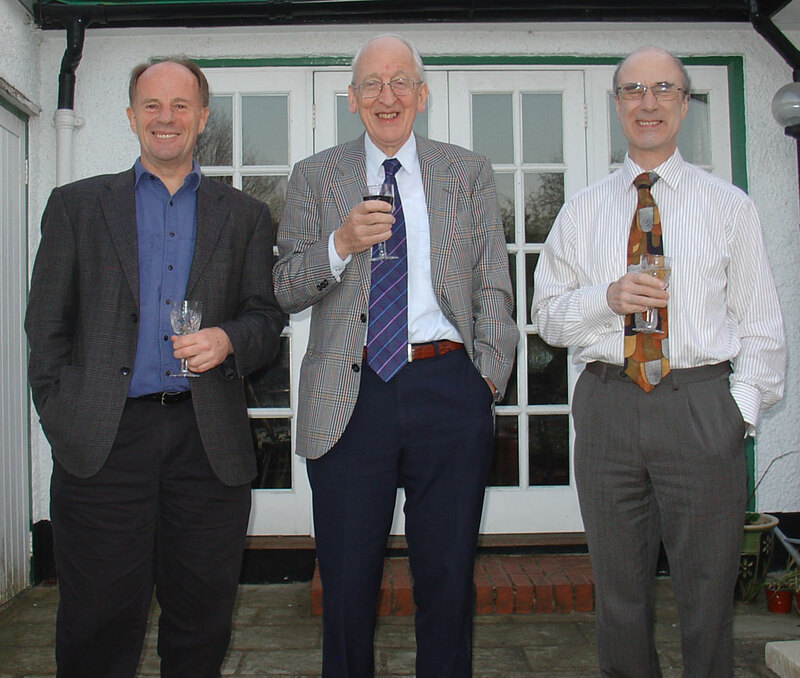 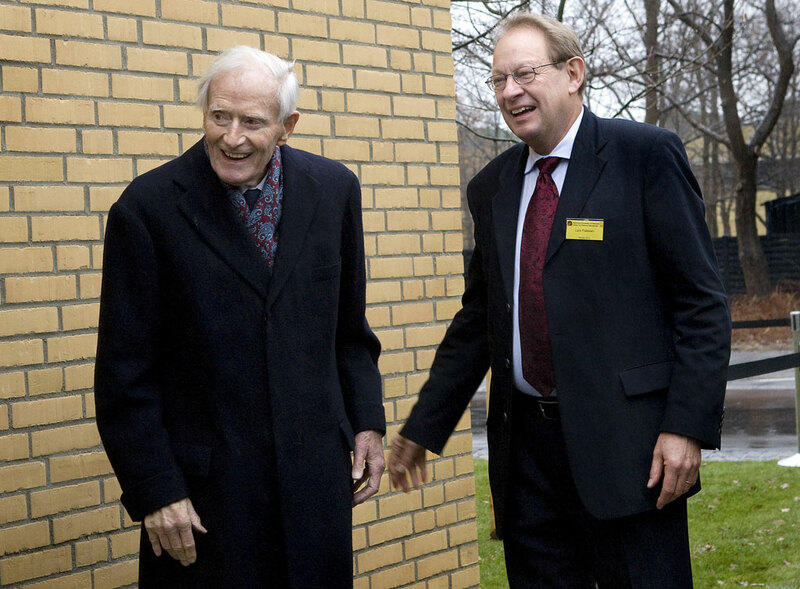 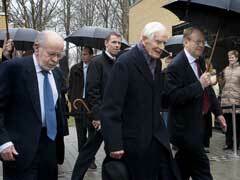 David Smith, Archie Howie, Owen Saxton. 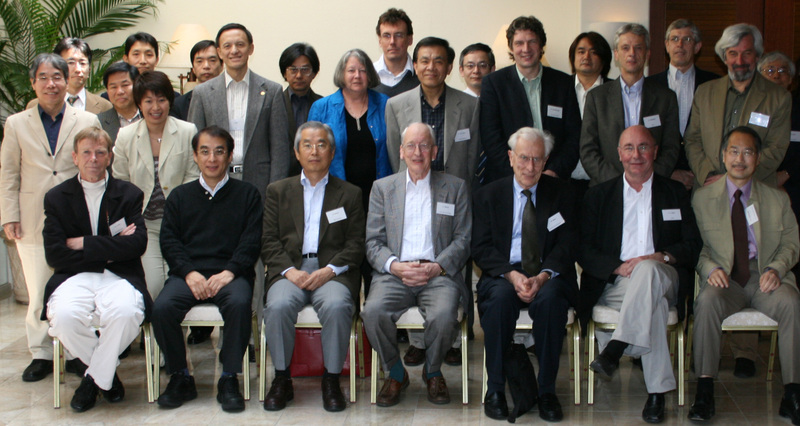 OIST Workshop "Future of Electron Microscopy"
Standing: Hideki Ichinose, N Matsushita, T Sato, Yoshifumi Taniguchi, Kimi Matsuyama, Yoshizo Takai, Yimei Zhu, Keiichi Namba, Molly McCartney, Rafal Dunin-Borkowski,Sunshine Chen, Tsukasa Hirayama, Werner Kuhlbrandt, Kazutomo Suenaga, Uli Dahmen, Ken Downing, Max Haider, Hirotaro Mori. 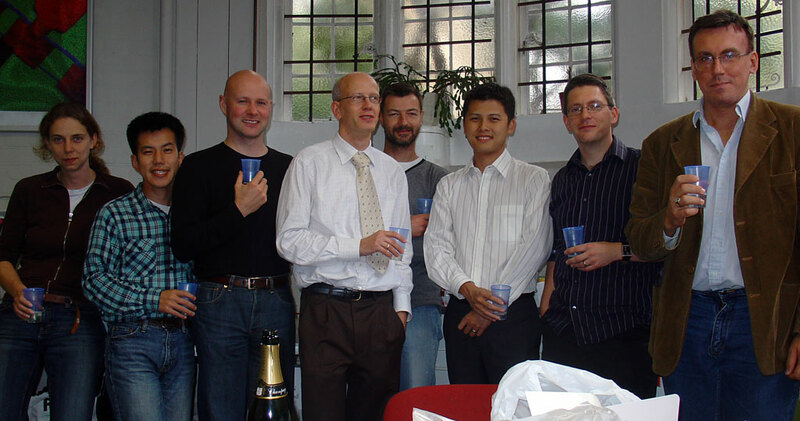 Seated: Hannes Lichte, Akira Tonomura, Sumio Iijima, Archie Howie, Harald Rose, Christian Colliex, Kunio Takayanagi.